Good evening, and Happy Tuesday, Dear Readers! First, an update–today my replacement blender part came in, the cutter bit that needed replacing. Aunt Kathy reminded me that there were likely broken blender particles in my fresh pesto, so I tossed it on her advice. Yes, it broke my heart to do so, but it’s infinitely cheaper than an emergency room visit. Now that my blender is whole again, I’ll buy some basil and parsley and make more for the freezer. Yes, it’s cheating, but the parsley is growing back and eventually, the basil will too, so I’ll make it with patio garden stuff again soon. How hot is it in Houston? I didn’t touch hot coffee today. I drank ice water all day in the office. I could do it tomorrow, too. Ugh. Welcome to summer. We’re paying for the recurrent winter we enjoyed this year. VERY glad for lettuce packed in a jar. It’s been a busy week, with some big news for foodies–it looks like the gluten-free need is really getting the attention of the food industry. So many times I’ve gone into Starbucks asking for something gluten free–now Dunkin’ Donuts is now paying attention and beating them to the punch. Yes, you will soon be able to get GLUTEN FREE DONUTS and other healthier options at Dunkin Donuts. Now if they would put a Dunkin’ Donuts in my neighborhood, I could give you a critique. One word of warning: you still need to read labels before you start diving into a GF donut, cookie or other wheat-free treat. I’ve had a few very delicious gluten-free things that the first ingredient on the list is. . .sugar. If you’re diabetic, or watching your weight, beware–you may be eating sugar blobs. Speaking of sugar blobs. . .Twinkies return July 15th. Yes, fellow foodies, we can once again enjoy classic American sugar blobs and empty calories. You bet I’m having one! ONE. Or, one packet. But as I mentioned recently, you can find reasonable facsimiles now. I keep telling y’all about that new cupcake place in the downtown Houston tunnel, New Addictions, and yes, there are always a couple of customers there when I pass during my lunchtime walk. Saw the owner, Justin, talking to several customers just this afternoon on my third lap. On each lap, I see at least two or three customers each time and they aren’t the same folks. And now, I can personally attest to their awesome cupcakes. It wasn’t my fault. Honest. We had yet another birthday in the office last week, and this time, cupcakes were ordered from New Addictions. One dozen, three of each flavor: chocolate chip cookie dough, chocolate peanut butter, red velvet and carrot cake. Each was loaded up with icing and politely I tried, I really tried, to leave it alone. I even scarfed down some raw almonds first so I wouldn’t have room for a cupcake. Resistance is futile. Even for the stalwart. I didn’t actually *eat* one cupcake. I split one with another office mate to taste test it. Chocolate peanut butter, of course. 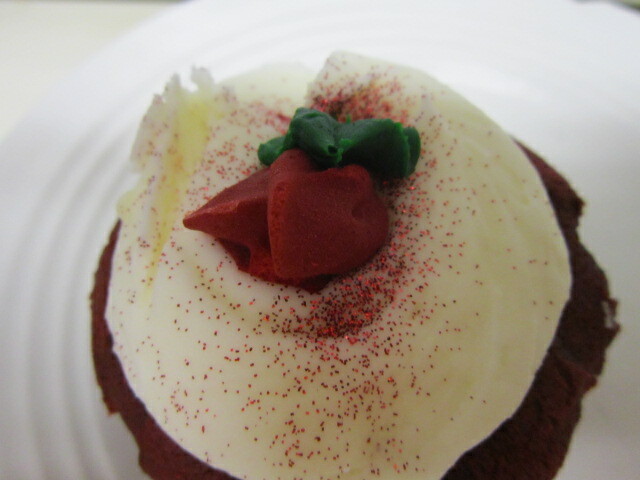 And then a quarter of a beautiful red velvet one the next day. No, it wasn’t gluten free. They’re not yet set up for that, so I’ll keep looking for gluten free. Or make them myself. And spend a lot more time a) walking b) running c) doing Pilates and/or yoga until I injure myself and d) pretending to ski on my beloved Nordic Track. I used it last week after that first taste test for half an hour then did some sit-ups and stuff for another 20 minutes. So what was it like? Soft, pillowy cake and sweet buttercream icing. Yes, as heavenly as the minister wants them to be. No, seriously—Justin really is a minister, and the cupcake is heavenly. Even the boss lady had half a cupcake—she had a rough day. I say she deserved a cupcake, too. 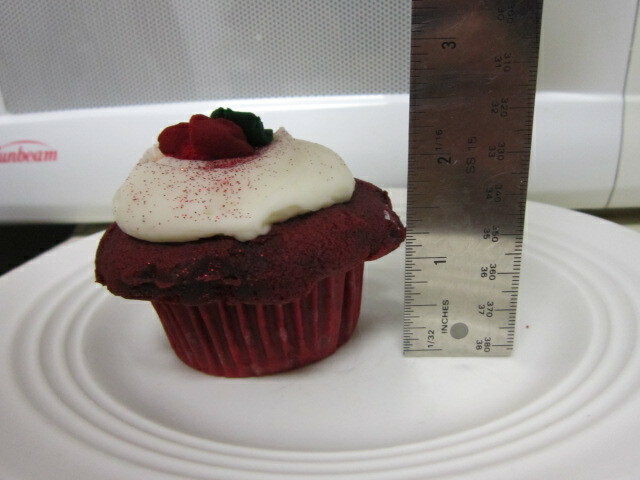 There was one left, a beautiful red velvet cupcake. I took it home for my elderly neighbor who doesn’t get out as much as she used to. Now, remember that I work in downtown Houston, take the bus every day, and it’s summer. So I took that plastic crate that they came in, loaded it into a plastic grocery bag, holding the one remaining cupcake, sat next to the window on the bus so I could get the cool air blowing into the bag to keep the frosting from melting, ran to my vehicle, cranked up the AC, and got it home with the icing intact. Once home, I removed it carefully, put it on a plate and in the fridge where I nicked the icing on the ceiling of the fridge. Almost. . . . Still, it’s pretty nice looking. Having taste tested part of another split red velvet cupcake (about a third, I think), I can attest to its deliciousness and texture, too. I had to go run an errand for a friend, and brought the cupcake to my neighbor after I got home. The icing was definitely cold from the fridge. Speaking of heavenly sweets. . .I baked up Nigella’s Chocolate Olive Oil Cake from her new book Nigellissima the other night. Not difficult at all, and with almond flour, pantry staples and 3 eggs, it’s an easy gluten free. No kidding. You can also use regular flour if you’re not of a mind to mess with almond flour. I’m not trying that, ‘cause I like to have my cake and eat it, too. I also used SomerSweet instead of superfine sugar. You do have to plan ahead, because this cake takes 40 to 45 minutes to bake, and some time to cool off. Is it worth it? Absolutely! It looks exactly like it does in the book, so if yours looks funny. . .well, make sure you follow the directions, and let it cool, of course. Oh, and read the recipe all the way through BEFORE you start cooking or baking anything. This recipe is really simple, but not so simple that you can skip steps—so do it to spec at least once so you know how it’s supposed to come out. I can’t tell you how many times I’ve either not done that or read it halfway and then was surprised by something. Or decided to substitute something and was quite disappointed. I’m not encouraging you to drink if you don’t want to or should not. But if you do. . .red vermouth is delish. Anyway. . . I made the dish that I bought it for on Sunday during my weekly cooking spree, and it sure is good. On page 76 is Sausages with Beans & Roasted Red Peppers. Doesn’t take long to cook, and if you keep butter beans or cannellini beans in your pantry, some canned tomatoes and roasted red bell peppers, and some fresh Italian sausages. Oh, and that wonderful red vermouth. Oh, yeah. . . . Remember that the quarter-cup of alcohol cooks out–it’s not boozy, and the flavor left behind is wonderful with the tomatoes and roasted red bell peppers. Great weeknight meal, although I’d leave it for winter with the heat we’re having here in Houston. It’s getting late, ladies and gentlemen. I’m going to bed. I will report on some more foodie adventures soon, soon as I get a good night’s sleep, and find my way around to some. Go with the warm feeling–it was intended to be nice! !